This year we celebrate the 150th anniversary of one of the most significant breakthroughs in science, the creation of a tool that allows us to make sense of the basic ingredients of our universe, and that still fuels research and innovation today: the Periodic Table of Chemical Elements. The International Year of the Periodic Table of Chemical Elements 2019 celebrates the potential that is unleashed to create the solutions we need for sustainable development, enabling scientist to predict the appearance and properties of matter. It will open on 29 January with a day of conferences and debates highlighting the relevance of the Periodic Table in addressing relevant challenges for sustainable societies, in fields as diverse as health, food security or energy, which will be available through a live webcast. In 1869, Dmitri Mendeleev realized that when organizing the known elements by atomic weight, certain types of elements occurred regularly. This system indicated that there is a link between the structure of an element and its properties, and showed gaps between known elements, allowing Mendeleev to predict the existence of elements that were still unknown, which was soon verified with the discoveries of gallium (1875), scandium (1879) and germanium (1887). Medeleev’s achievement is an important milestone in a story that stretches over millennia, beginning in the 9th century when alchemist Jabir ibn Hayyan first isolated the chemical elements arsenic (Ar) and antimony (Sb). The Periodic Table enables scientists to predict the appearance and properties of elements that were yet to be discovered. A few decades later, following the discovery of radioactive elements, Marie Skіodowska Curie and Irene Curie conducted the first diagnostic procedures for wounded and shell-shocked soldiers in mobile front-line hospitals, in what was the first medical application of radiation. Today, nuclear medicine is essential for diagnostics and targeted therapies alike. The first artificial elements (neptunium and plutonium) were discovered in 1940-41. There were about 60 known elements when Mendeleev completed his work on “The experience of a system of elements based on their atomic weight and chemical similarity” on 1 March 1869. Today 118 elements have been identified, of which the first 94 occur naturally on Earth and the remaining 24 are synthetic. The quest for new elements continue, and inspires our exploration of space. 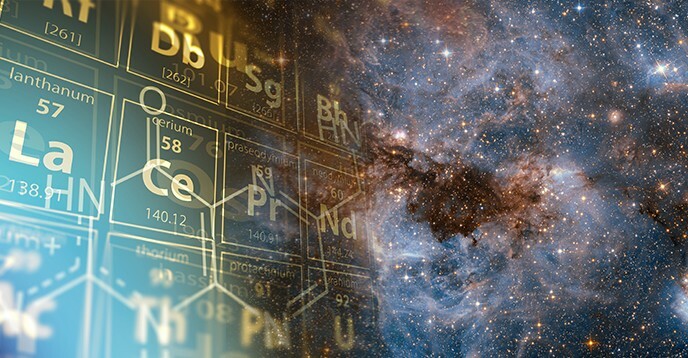 Modern observations indicate that chemical elements account for about 5% of the total mass-energy of the Universe, and most are provided by “dark” energy (69%) and “dark” matter (26%), the nature of which is still unknown. Powerful quantum predictive methods were developed in the search for new elements, leading to the discoveries of new materials and novel chemical phenomena and expanding the boundaries of knowledge. The International Year of the Periodic Table of Chemical Elements 2019 is an opportunity to reflect upon many aspects of the Periodic Table, including its history, social and economic impacts, the role of women in research, and global trends on science for sustainable development. The opening event will include a lecture by Ben Feringa, 2016 Nobel Laureate in Chemistry, and Yuri Oganessian, who played an important role in the synthesis and study of the heaviest – and newest – elements from 104 to 118. It will also be an opportunity to launch the initiative “1001 inventions: journeys from alchemy to chemistry”, which will promote science education for all through live events, science theatre, and hands-on experiments. The International Year of the Periodic Table of Chemical Elements was proclaimed by the United Nations General Assembly. It is led by UNESCO together with the International Union of Pure and Applied Chemistry (IUPAC), the European Association for Chemical and Molecular Science (EuCheMS), the International Science Council (ISC), the International Astronomical Union (IAU), the International Union of Pure and Applied Physics (IUPAP) and the International Union of History and Philosophy of Science and Technology (IUHPST).